Capsule CRM is something called Customer Relationship Management software; it allows you to centrally manage all your customer relationships, contacts and interactions, your sales pipeline, and so much more. To set up CapsuleCRM and KashFlow just follow this quick step-by-step. 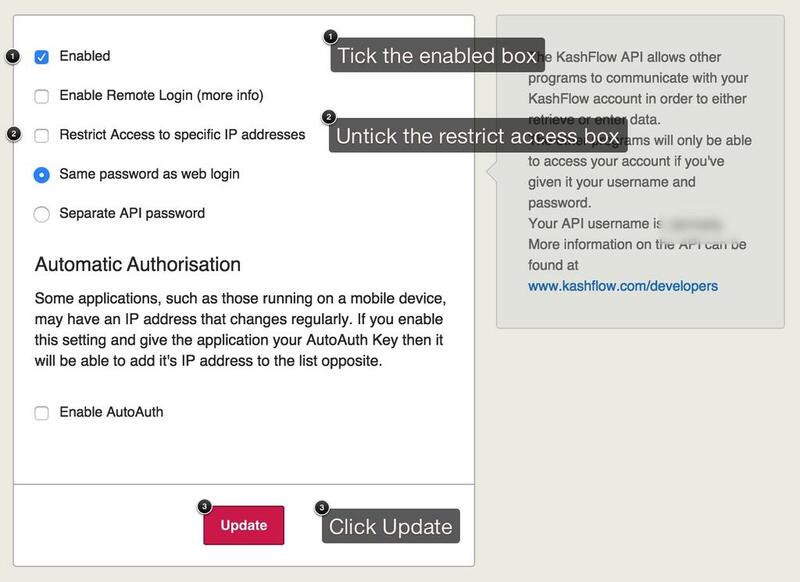 To start, you will need to enable the KashFlow API by going to Apps> API Settings (Top right) and tick the box for Enable API and un-tick the box for Restrict Access by IP. Once saved, Capsule will automatically link customers and invoices from KashFlow into your Capsule account. Sometimes when you are trying to use the Kashflow integration with Capsule CRM, you will find that the two are not linking as they should and might come across the error “Accounting service unavailable” message in Capsule. Do a synchronisation in Capsule CRM but before you start to synchronise, make sure that you are out of any organisations in CRM and can ensure this by going to the dashboard view in capsule and then to synchronisation. The problem should now be resolved. If you have tried this and it has not rectified the issue, please send us the capsule URL you are using to view the customer record in Capsule to support@kashflow.com.